Doncaster Rovers showed their powers of recovery in a dramatic 3-3 draw with Gillingham. But it still arguably felt like a case of two points dropped for Rovers against a Gills side there for the taking. The visitors raced into a two-goal lead with impressive first half strikes from left back Barry Fuller and big striker Tom Eaves. John Marquis scored his tenth of the season and Mallik Wilks nodded in from close range to get the home side back on terms after the break. The Gills thought they had snatched all three points when centre back Max Ehmer smashed home from a corner in the dying moments. But substitute Paul Taylor’s deflected shot earned Rovers a deserved share of the spoils. Rovers had 19 shots to Gillingham's two in the first half but went in at the break trailing 0-2. 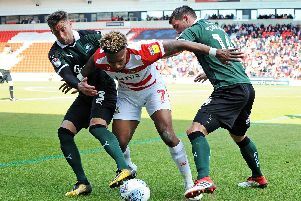 It felt like the 4-0 home defeat to Fleetwood game all over again, in which Rovers did not play badly by any means but were clinically put in their place. Fuller broke the deadlock in sensational fashion after just six minutes when he latched onto a headed clearance from Ben Whiteman and lashed home from 30 yards out. Eaves doubled the visitors’ advantage midway through the first period when he made a mug of Tom Anderson, in for the suspended Joe Wright, before drilling a shot into the bottom corner. The pattern of play, however, was wave after wave of Doncaster attacks - with just the finish missing. Marquis went clean through but saw his shot blocked by goalkeeper Tomas Holy, Wilks hit the side-netting and Matty Blair, James Coppinger, Herbie Kane and Andy Butler all went close. It took Rovers just six minutes of the second period to do what they failed to do in the first when, from a corner, Marquis prodded home following a goalmouth scramble. Marquis went close to a leveller when he charged down Holy's clearance but it dropped just wide. Rovers were soon level though when, from another Coppinger corner, Blair did superbly to keep the ball in and head back across goal for Wilks to nod home. Wilks headed a good chance straight at Holy and Coppinger warmed the visiting goalkeeper’s hands with a clean strike from the edge of the area as Rovers continued to look the most likely to claim all three points. Navid Nasseri broke clear but was stopped in his tracks by an on-rushing Marko Marosi before Ehmer thought he had won it with a powerful finish. Taylor had the final say when his shot from distance deflected past Holy before Whiteman twice went close to a last gasp winner. Gillingham: Holy, O’Neill (Nasseri 74), Ehmer, Zakuani, Fuller, Lacey (Bingham 56), Byrne, Reilly, Stevenson (Ogilvie 56), Eaves, Parker. Subs not used: Garmston, List, Rees, Hadler.